We love movies for a wide array of reasons – they entertain us and make us feel. When it comes to adrenaline pumping, there’s nothing like a good stunt scene from a movie to get you, the viewer, sweating from anxiety and screaming at the screen. The best scenes that make that happen are stunt scenes, and they all come in various genres and themes. However, some are basically better than others and if you want to know which 15 movie stunts are the greatest ever, continue on reading. The creators of Inception really went outside of the box (or a box within a box? ), stunts included. 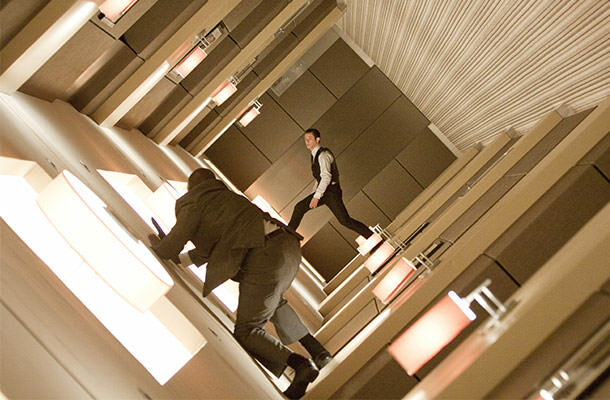 The most prominent stunt in the popular blockbuster was the spinning hallway scene, when the dreamer is located in a van that tips and rolls down an embankment. Simultaneously, two characters in the dream experience the same rolling, dizzying motion as well, smack in the middle of a fight! In order to film the rolling fight scene, the crew originally built a 100-foot long set (that kind of looked like a hamster wheel) with cameras mounted on it in every nook and cranny. The actors had to learn the fight choreography for weeks before they could actually perform it, and when they finally did, they started off with a slowly spinning room. Eventually, they ended up with the tricky, speedy, spinning hallway fight scene in the movie.